At an event in Seattle this morning, Amazon unveiled its next-generation Amazon Echo speaker, which features a new smaller design and better sound than the original Echo to compete with products like Apple's upcoming HomePod. Apple focused heavily on sound quality as a way to differentiate the HomePod from existing smart speakers like the Google Home and the Amazon Echo, with a 7 tweeter array, a 4-inch upward-facing woofer, and an A8 processor capable of advanced acoustic modeling and spatial awareness. Shortly after the HomePod was unveiled, rumors of a higher-end Echo surfaced. Amazon's new Echo supports Dolby Audio and it has a dedicated woofer and tweeter, features Amazon says bring better sound. It also includes second-generation voice recognition capabilities, second-generation far-field microphone technology, and support for multi-room audio so several Echo devices can be used together. The Echo is made from metal and is wrapped in a fabric shell, which can be swapped out with other shells for customization much like the Google Home. Amazon is offering six shells for the Echo. Amazon plans to charge $99 for the new Echo, making it much more affordable than the HomePod, which will be priced at $349 when it launches in December. Pre-orders for the new Echo are available today. There's also a new Echo Plus, with built-in Zigbee functionality for smart home hub functionality and all of the same improvements in the new Echo model. It's designed to work with a wide range of smart home products right out of the box, with over 100 partners signed up. Echo Plus is similar in design to the original Echo, while the new $99 Echo is smaller and shorter. Amazon is charging $149 for the Echo Plus, and it comes with a free Philips Hue bulb. Echo Buttons, also new, are priced at $20 and are designed to allow Echo owners to play trivia games with the Echo, and the Echo Spot is a new Echo device that features a 2.5-inch circular display. It's a cross between an Echo and a smart alarm clock with a price tag of $130. Along with the new Echo models, Amazon announced the $35 Echo Connect, a device that's designed to plug into a phone jack on one side and an Echo on the other, allowing the Echo to be used as a telephone able to accept calls from a person's standard home phone number. The Echo Connect is also available for pre-order today. Amazon Echo speakers are also gaining call functionality that will let them make phone calls to any number. Meh. For $99 you it may have better sound than their previous speakers but it's not going to be on the level of the HomePod. I wouldn't even go as far as to call it direct competition. Then intentions of the two devices are much different. So you're telling us that something you haven't heard sounds better than something else you haven't heard. That's some real valuable insight right there. We have Iphone 6s and 7. Both have Apple Watches. both have macbook pro, Ipad Air --- so pretty much an Apple household. BUT - we have Alexa and it works great. Way more helpful than Siri for lots questions. Very easy to do music and change stuff like lights, temperature, front door video (we got a Show too). Why in the world Apple has taken so long to get into this space and home automation is beyond me. Well looking how 'great' Siri works on all the Apple devices it seems like Apple is building a really expensive speaker with a ****** voice assistant. Alexa is just so so much better. First thought as the picture scrolled into view: sloping sides, okay... Clear? Huh... Wait, is that water? -- Oh, that's the coffeemaker. The speaker must be the Coke can wrapped in burlap. Laughing at the Echo connect, who still has a home phone these days? I know there are some, but really, it is very few people. Actually, I do. I work from home 95% of the time, so having a land-land (VoIP) provides more consistent sound quality plus I can use better equipment for talking. For me, having something like the Echo-Connect is a great idea! In addition, many of us have older parents. I'll put one or two of these at my mothers house and cheerfully pay for a land-line just so I can call and she can answer without having to do anything but say "Alexa... answer". That's a HUGE safety and security feature. Where is the Amazon Video for the AppleTV? Thanks, we certainly all appreciate your most professional opinion on something you haven’t even heard yet much less seen. [doublepost=1506539156][/doublepost]One thing I must say about Amazon and their native products; with their competitive pricing and strong innovation, they’re at least driving up the competition which could only benefit the consumer. 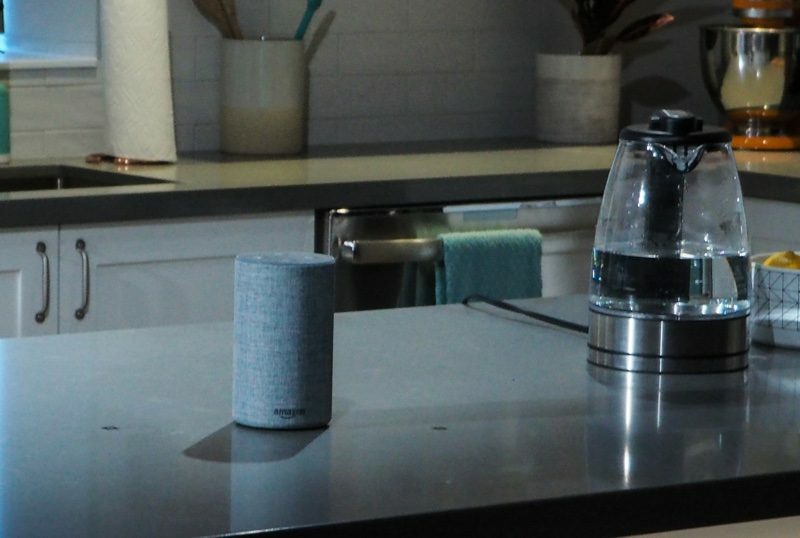 Amazon is taking a different approach however - integration with Sonos. I have a nice setup throughout my house of various Sonos speakers. Alexa will integrate with Sonos soon. Most likely the announcement will be on October 4. As much as I love Apple products, nothing comes close to Sonos. I'm hoping Homepod or Siri in general with integrate with Sonos, but Amazon is already one step ahead. And not only did it take them so long... Apple is entering this market with a premium priced device. In fact... it's the most expensive home-automation-speaker-thing to date! This isn't that unusual for Apple... but still.